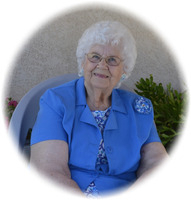 Provide comfort for the family of Nellie Smart with a meaningful gesture of sympathy. Nellie passed away peaceful in her sleep in the early hours of Jan. 4. after a short illness. She is survived by her sister, Sammie Roberson her brother, Elmer Blagg, 5 children, Suzanne Hunter (Hal), Herbert Smart (Sharon), Stephen Smart, Samuel Smart (Kimberly), and Sallie Smart. She had 13 grandchildren, 30 great grandchildren and 8 great great grandchildren. She was proceeded in death by her husband, Herbert Smart Sr., Grandson Gregory Smart and 1 sister and 8 brothers. Nellie was born in Gentry Arkansas to Samuel and Tilda Blagg. She lived most of her life in Oakdale CA. She spent her early years as a wife and homemaker and mother to her 5 children. She was a member of Life Community Church for over 50 years. She worked at Campbell Soup for a few years before going to work at Hershey, retiring at the age of 70 in 1999. She was loved by everyone that met her smiling face will be missed by all. To plant a memorial tree in honor of Nellie Smart, please visit our Heartfelt Sympathies Store. We encourage you to share your most beloved memories of Nellie here, so that the family and other loved ones can always see it. You can upload cherished photographs, or share your favorite stories, and can even comment on those shared by others. In memory of a loving great-grandmother and sweet and warm Lady that will be missed and fondly remembered.